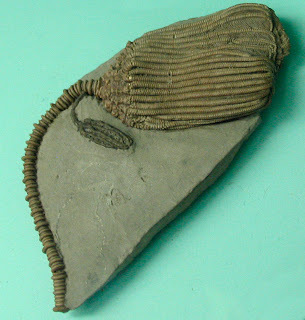 The crinoid Dizygocrinus indianensis Lyon & Casseday probably of the Carboniferous Period found in Indiana. Fossil is on display at the Smithsonian Museum of Natural History as of August 2010. Their collections database lists a species as being found in Montgomery County, Indiana in the Osage Group (Keokuk Limestone). In addition, it lists as from the Lower/Early Mississippian Period (USNM # S 5988).